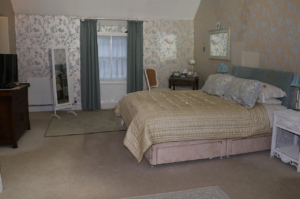 The accommodation offers a spacious bedroom, a sitting room, kitchen/diner and conservatory. The bedroom has a king-sized bed with an open-plan en-suite bathroom which includes a stand-alone bath and separate walk-in shower. Between the lounge and kitchen is a downstairs WC. The Retreat has its own patio area within a shared garden. There is reserved parking for one car in our private car park. Price per night (3 nights minimum) from £75. Discount for 7 nights. For more details please go to our website.